The term sciatica refers to pain that is associated with the sciatic nerve’s pathway. The nerve travels from your low back, down the back of your thigh to your knee, calf, feet and toes. It’s the sciatic nerve that is responsible for controlling muscle activity and sensation in your leg. An estimated 40% of the population will experience sciatic pain. If you have ever experienced sciatic pain you will be aware of how limiting to your lifestyle it can be. Basic daily functions like walking, sitting, bending and lifting can all be affected. Sciatica is the term used to describe any type of pain or symptom that travels down the path of the sciatic nerve. This may involve symptoms such as tingling or numbness. The pain intensity and location can vary greatly depending on the severity of the presentation and the actual cause. The pain is caused by the compression of the sciatic nerve. Its important to understand that other issues in the low back and pelvis can mimic sciatic pain. Some people who present to our Newcastle chiropractic centre don’t actually have sciatic pain, but rather referred pain. A disc bulge is the most common cause of sciatic pain. The disc itself is made up of an outer ring structure and an inner soft part. 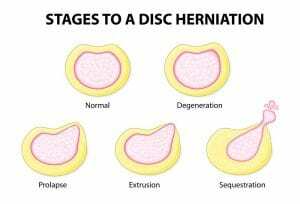 It’s really important to understand the type of disc herniation that is causing your sciatic pain. Treatment options between bulges and herniations can differ and affect your outcomes. Other causes of sciatic pain include; degenerative joint disease, spinal stenosis, abnormal spinal movement, sacro-illiac joint dysfunction, piriformis syndrome, spondylolisthesis, pregnancy, muscle strain and ankylosing spondylitis. Lie on your back, exhale and tighten your abdominal muscles, push your belly button towards the floor and flatten your lower back. Lie on your back, bend both knees with feet on the ground. Slowly bring one knee towards your chest. Hold for 10 seconds and the alternate legs. 3) All Fours Opposite Arm and Leg Extensions. Position yourself on all fours, keep your back flat and contract the abdominal muscles. Raise one leg upwards behind you and raise the opposite arm upwards in front of you. Hold for 5 seconds and repeat on your opposite side. If you are experiencing sciatic type pain it is important to receive a correct diagnosis. At family Life chiropractic we have a very through examination process to establish the cause of your pain. We understand the importance of explaining all findings before commencing treatment. If you’re after an experienced assessment on your sciatic pain it would be a pleasure to meet you. previous post: Thinking about seeing a chiropractor?